Firstly, Christlikeness and the mystery of suffering. Suffering is a huge subject in itself and there are many ways in which Christians try to understand it. One way stands out: that suffering is part of God’s process of making us like Christ. Whether we suffer from a disappointment, a frustration or some other painful tragedy, we need to try to see this in the light of Romans 8:28-29. According to Romans 8:28, God is always working for the good of his people, and according to Romans 8:29, this good purpose is to make us like Christ. So I conclude, as a brief summary of what we have tried to say to one another: God’s purpose is to make us like Christ. God’s way to make us like Christ is to fill us with his Spirit. In other words, it is a Trinitarian conclusion, concerning the Father, the Son and the Holy Spirit. How true this is. As Christians we often try too hard to live the life. WE can't do it. Paul tried it only to fail at every turn;Only to cry out in despair 'Wrethed man that I am:who will deliver me from this body of death. But then he heard the answer:'Thanks be to God through Christ Jesus has set me free from the law of sin and death'. Its getting to know him; to walk with him;to learn of him; to pour our hearts out to Him that can change us through the work of the Holy Spirit. I realise that this comment is long after the original post, but I only found out about this blog after meeting my old friend Andrew again after a long time. I have some personal reflections of John Stott's last address. My wife and I were on holiday in Keswick in July 2007, and decided to attend a few of the sessions at the Convention. The tent was easy to find, just follow the person with the biggest and blackest bible :). 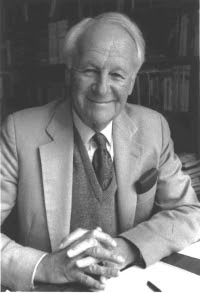 One of the sessions was the address by John Stott. We were unaware that it was his last public address, although we had the impression that he was there to say goodbye to Keswick. The tent was packed - I think it holds about 3000 people. There were two introductions as the present Keswick leaders spoke of their personal debt to Stott's ministry. When the man himself started to speak, he commented that he thought he was listening to his own obituary! It took two men to support him up the steps and one to help him across the platform. It was made clear that he would not be available to people after the session. During the half hour address, his eyes never left the prepared script. I must confess I remember little of what he said. What struck me most was the affection of the audience to this frail, elderly man at the end of his active public ministry. A Keswick conventioner is generally middle-aged, so these were people who had benefitted from Mr Stott's ministry at his peak. At the time, I was an enquirer in the Orthodox Church (I was chrismated in December 2007). My perspective is as an Orthodox Christian who used to be an evangelical. However, I count it a privilege to be present at the celebration of a great man and a fruitful ministry. And it (and indeed the Convention) was a refreshingingly robust form of evangelicalism which contrasts with much of what we see today.